Published: May 16, 2016 at 12:25 p.m. Updated: Aug. 24, 2016 at 10:01 a.m.
College Football 24/7's "16 for '16" series begins with a look at the top Heisman Trophy candidates for the coming season. Several factors align for the Cougars' quarterback to have a huge year. He's entering his third year in coach Mike Leach's system, he has his top target returning in Gabe Marks, and most of all, he'll likely throw the ball more than any quarterback in the game. Last year, he was the only FBS QB with more than 600 attempts. What he'll need to stay in contention, however, is more team success. 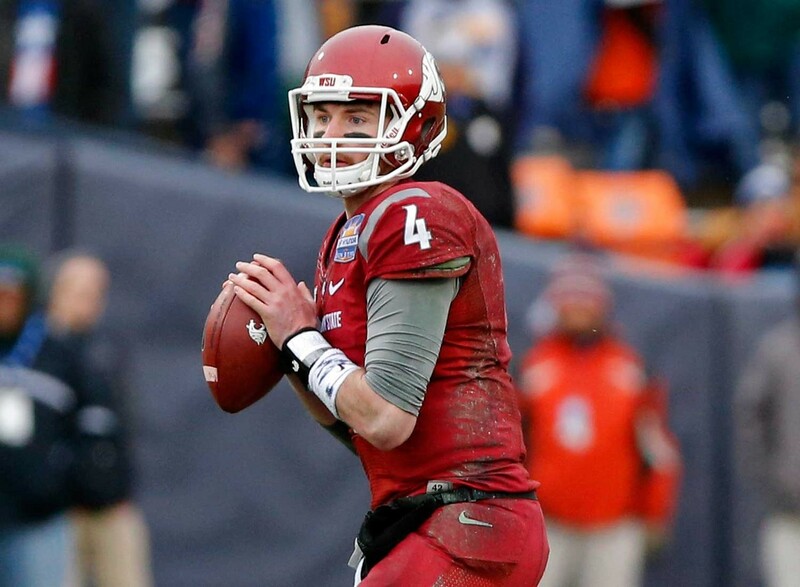 WSU had three losses before November last year, and Heisman candidacies take on water with each loss. Like USC's Adoree' Jackson, Peppers is a three-way talent who is a Heisman darkhorse because he's primarily a defensive player. But he has a lot going for him: He can play all sorts of positions (linebacker, safety, cornerback, running back, wide receiver, kickoff and punt returner), he plays for a prominent program and he's extraordinarily fun to watch. Like Jackson, to have any chance, he'll need to be the clear MVP on a team that goes into late November with some playoff momentum. Put Jackson on the underdog list, of course, because of the position he plays, but there is no doubt he's one of the elite players in the game. If he's going to have a chance to be the first defender to win the award since Charles Woodson, he'll have to light it up as a return specialist, which he's fully capable of, and get at least a smattering of action on offense. He'll also have to be the hero of a couple of big Trojans wins. Freeman quietly piled up 1,838 yards last year for the Ducks. Why was it quiet? Because the team lost three of its first six games and fell out of the spotlight that Marcus Mariota had brought the year before. Freeman's candidacy needs the help of an improved Oregon team challenging for another playoff berth. No, he's not in a Power Five conference and therefore he'll lack the exposure of other candidates. Through no fault of his own, that could hurt Ward's campaign, and that's unfortunate. But a quarterback who can throw it well enough to approach 3,000 yards through the air, plus rush for more than 1,000 as well, is fully deserving of the attention. The senior is a one-man offensive machine. There might not be a quarterback in the country with more pure passing talent than Rosen, who showed great promise under difficult circumstances as a true freshman starter last season. Rosen's potential as a Heisman contender is more about the weapons around him, and whether he'll have enough. UCLA lost its top back in Paul Perkins, plus Rosen's top two receiving targets in Jordan Payton and Thomas Duarte, to the 2016 NFL Draft. It's not clear when Chubb will be ready to play again as he rehabs a knee injury that made TV viewers cringe during an Oct. 10 game against rival Tennessee. But if he's back to begin the season, he's a Heisman threat. Between the Todd Gurley injury that created Chubb's midseason opportunity in 2014, and the half season he played last year until his own injury, Chubb has about one season of experience over a two-year period under his belt. His combined numbers from those two half seasons are breathtaking: 311 carries, 2,294 yards and 21 TDs. The last time we saw Perine, he limped off the Orange Bowl turf with an ankle injury that later required surgery. If he returns to his previous form, he'll again be one of the most effective rushers in the nation. Crucial for his Heisman candidacy will be a faster start; he had only one 100-yard game in the first six weeks of last season. That will require OC Lincoln Riley to feed him more carries (he had 13 or fewer in five of 12 regular-season games). Kelly is the definition of a gunslinger at the quarterback position, combining an arm that can make any throw with a killer instinct. The nephew of Buffalo Bills great Jim Kelly is the best returning quarterback in the SEC, and in Hugh Freeze's fast-paced offense, he'll pile up big numbers. The Buckeyes are Barrett's team, and he won't have to look over his shoulder with Cardale Jones in the NFL. Barrett took OSU to an 11-1 record in 2014 before an injury against Michigan ended his season. He still finished fifth in the Heisman voting that year, and eventually replaced Jones as the team's starter last year. He won't put up the numbers of some other passers listed here, but as long as OSU has a zero in the loss column, he'll probably be in the Heisman discussion. Russell's value to Baylor was evident last year when a neck injury ended his season with BU unbeaten at 7-0. The Bears subsequently lost three of their last five, albeit against a tougher stretch of the schedule. Fortunately for Russell, interim coach Jim Grobe is keeping the Bears' fast-paced offense in place. Russell should post big passing numbers once again, with help from explosive WR KD Cannon, and will merit Heisman consideration for as long as BU is in the hunt for a playoff berth. The most talented rusher in the ACC, Cook averaged 7.4 yards per rush last year and largely carried the Seminoles' offense. Defenses will focus on limiting him, but his ability to consistently make the first tackler miss will lead to big plays anyway. His best three chances for a "Heisman statement" game: Ole Miss to open the season, Clemson on Oct. 29, and Florida on Nov. 26. Mayfield was arguably the biggest snub of those that weren't invited to the Heisman ceremony last year. The former walk-on was nothing short of spectacular last season in passing for 3,700 yards and 36 touchdowns. His energetic style, and ability to avoid the rush and extend plays outside the pocket, makes him college football's most exciting quarterback to watch. One of three Heisman finalists last year, McCaffrey is already the NCAA record holder for all-purpose yardage in a season (3,864). He's made routine work of making Pac-12 defenses look silly, not to mention his effectiveness as a return man. The son of former NFL WR Ed McCaffrey should be right back in the Heisman hunt. Last year's Heisman front-runner for the majority of the regular season returns for what will certainly be -- as long as he stays healthy -- his third consecutive 1,000-yard campaign at LSU. Fournette's raw power and the ease with which he breaks tackles is without peer in the college game. A more effective passing attack to help keep opposing defenses from stacking the box would help his chances. With Watson being a Heisman finalist last year and nearly winning a national title, the Heisman punditry will make him the early favorite for the award. Early momentum doesn't mean much, something Leonard Fournette learned last year, but Watson's candidacy is as much or more legitimate than anyone's. His accuracy and escapability when the pocket breaks down is uncanny.